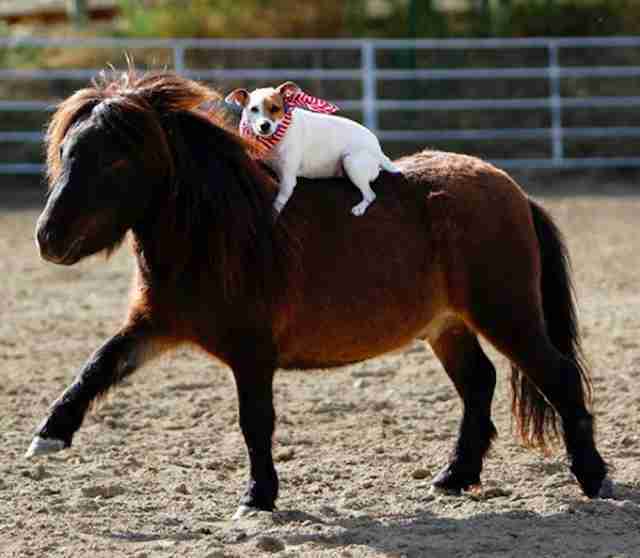 "She hopped up onto Spanky’s back from the step stool … and that day they became inseparable." 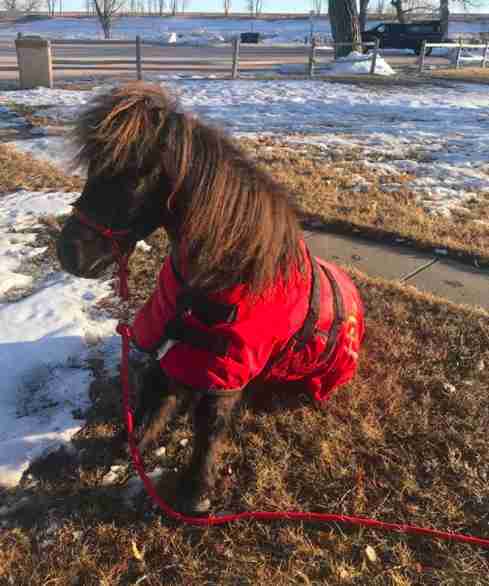 When a woman approached Francesca Carsen and Steve Rother about taking in a 2-year-old miniature horse who was apparently aggressive toward both humans and other animals, they weren’t sure what to think. 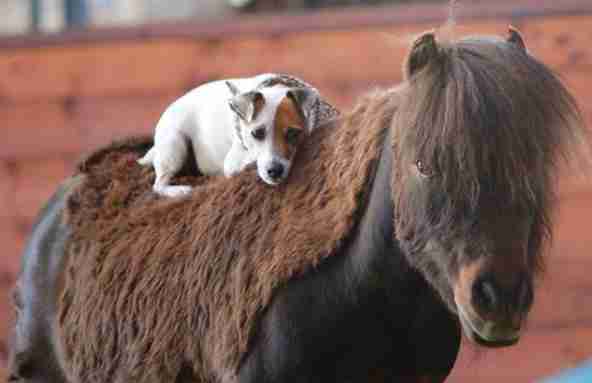 The pair run a ranch and had experience with rescue animals, and as soon as they met Spanky, they knew he was coming home with them. When Spanky first arrived at his new home, he made it clear he was not going to give up his bossy, aggressive ways without a fight. 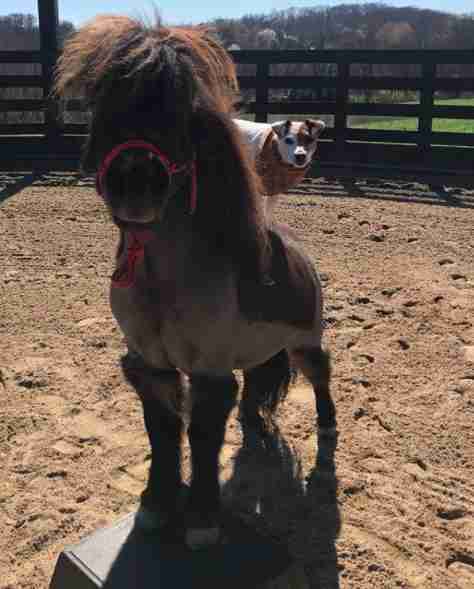 He wreaked havoc on the ranch for his first few weeks, but his new rescue family was persistent, and finally, after a year of patience, love and training, Spanky was like a completely different horse. He was still a little mischievous, of course, and was still hesitant to bond with others — until he met Dally. Dally was the runt of a litter born to one of Carsen’s friends, and no one seemed to want her. Carsen heard about Dally’s plight and offered to take the tiny dog, and from the very beginning, Dally was absolutely obsessed with Spanky. At first, Spanky was kind of indifferent to Dally. He was careful around her and went out of his way to make sure he didn’t step on her, but other than that, he didn’t exactly return her fascination with him. 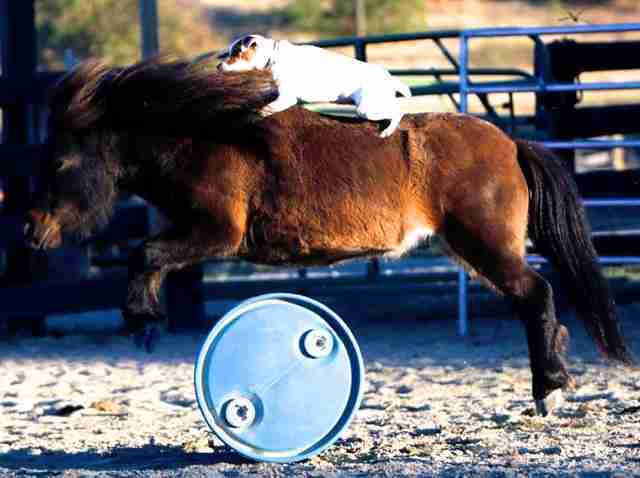 That is, until one day, when Dally decided to try and ride Spanky. As soon as Dally climbed onto Spanky’s back, he suddenly loved her right back, and from then on the pair have been the best of friends. They take naps outside together and hang out in Spanky’s paddock. Their mom decided to write a book about their adorable adventures, and 20 percent of the proceeds goes to charity. Dally and Spanky have touched and inspired so many people — just by being friends. Even though Spanky was reluctant in the beginning, Dally quickly changed his mind, and now the pair love spending every possible moment together. 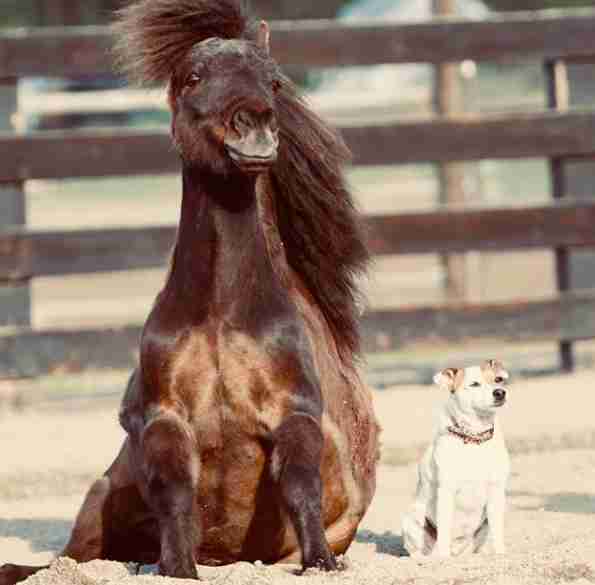 They both started out life unwanted and misunderstood, but now they have each other. You can follow Spanky and Dally on their Instagram account.